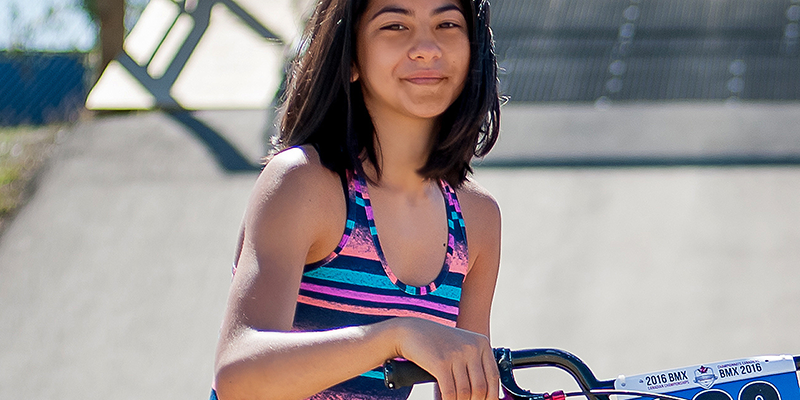 Violet Cejalvo has been racing BMX since she was 7 years old. She has travelled all over North America racing her bike with her family and the training must have paid off because she holds BMX Canada’s National #1 Amateur for three years in a row. Violet has her sights set on her first world championship race, held this summer in Rockhill, South Carolina. She is currently working on jumping the first obstacle off the 10 metre high Supercross hill. This is going to be a big challenge for her as she has crashed attempting this before. She dreams of one day representing Canada at the Olympics, and is working hard to achieve this goal. When not racing BMX, Violet is an honour student, and an amazing artist. When not dreaming of the Olympic gold, she dreams of pursuing a career in graphic design. You can find Violet presenting at this year’s FEAT Kids show as well as in a Disney princess ad campaign coming out this summer where she shows off her bike skills.